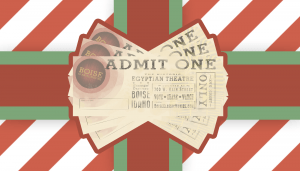 Give the gift of Boise Classic Movies! BCM gift cards are each worth $20 to spend on BoiseClassicMovies.com. They're a perfect gift for employees, clients, or loved ones! Did you receive a $20 gift card? Redeem it by clicking here. We also have $50 gift cards.